" Sclater's Superior Ice Cream - Unused Flat Carton - C 1940." (1862) Sclater's Superior Ice Cream - Unused Flat Carton - C 1940. -Condition: Very Good Carton still in flat unused condition. 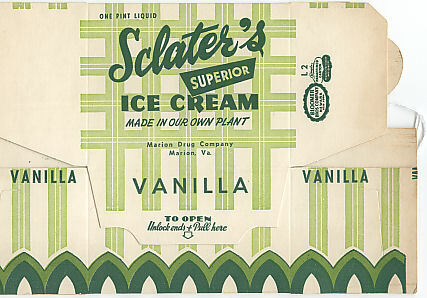 Sclater's Ice Cream was made by the Marion Drug Company. Carton measures 8 1/2" by 5 1/2". There are 3 cartons available. Price: $3.00 (per carton) + shipping.